Eek!!! I have to admit to you that I totally get the heeby jeebies around spiders. I think it’s because they are so tiny and come out of their hiding spaces so unexpectedly. Plus, the feat of poisonous bites of course. Eww. You also just never know when you might run into a poisonous one!!! 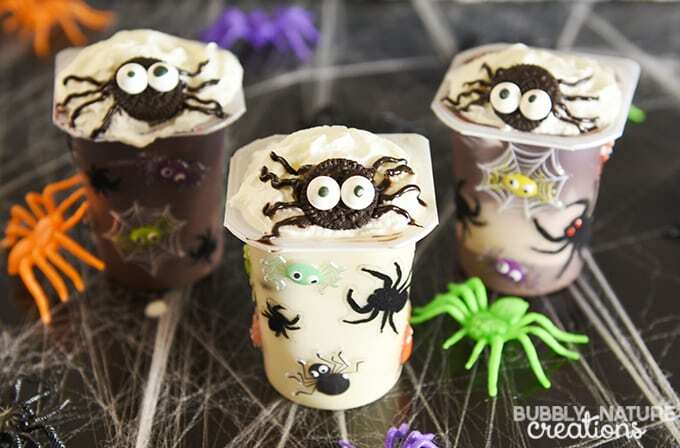 Spiders can be a frightening sight, but they sure make a cute Halloween snack with these Spider Infested Pudding Cups! This post has been compensated. All opinions are mine alone. My kids were totally in love with these cute little spiders. We all loved the cute bug eyes and they had fun decorating the cups with stickers galore. The big surprise is inside the pudding cups where more “spiders” which are really just more cookies are waiting inside. For a fun Halloween inspired theme make these Full Moon Pumpkin Patch Pudding Cups paired with these Spider Infested Pudding Cups! How fun would these be for a Halloween Party or Get-together? Plus, these are super easy to make just using the Pudding Cups, Reddi-Wip, Mini OREO cookies, chocolate icing and some candy eyes. I found all the supplies I needed at Walmart. They always have a great variety of Snack Pack Pudding Cups and I love having the option of the Super Snack Pack size. These will also work with any regular sized pudding cups. 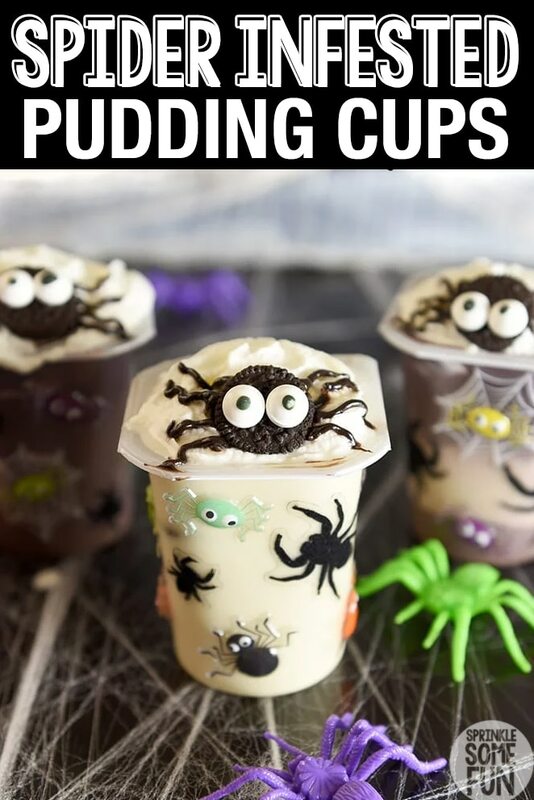 Both kids and adults always have a lot of fun making spider infested pudding cups. For a fun party idea; have all the items to create these pudding cups set out and have all your guests create their own. 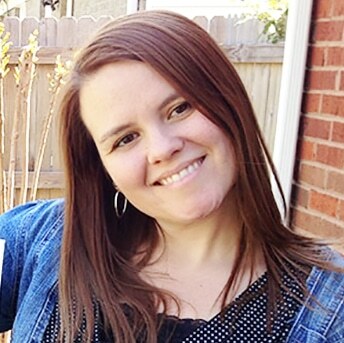 You could even have a judging contest to see who made the best one! Cute spiders are infesting this pudding cup! All the kids love the taste and fun these bring for Halloween or anytime. To make these pudding cups look spider infested I used spider stickers around the outside of the Snack Pack pudding cups. I then added a few mini OREO cookies to mix in the pudding and make the pudding reach the tops of the cups. I added the Reddi-Wip to the tops of the pudding cups and added one mini OREO in the center. From there I piped chocolate icing with a #2 tip coming out from the mini OREO to look like legs. Then I added the eyes with a little icing on the back! I think they turned out super cute! 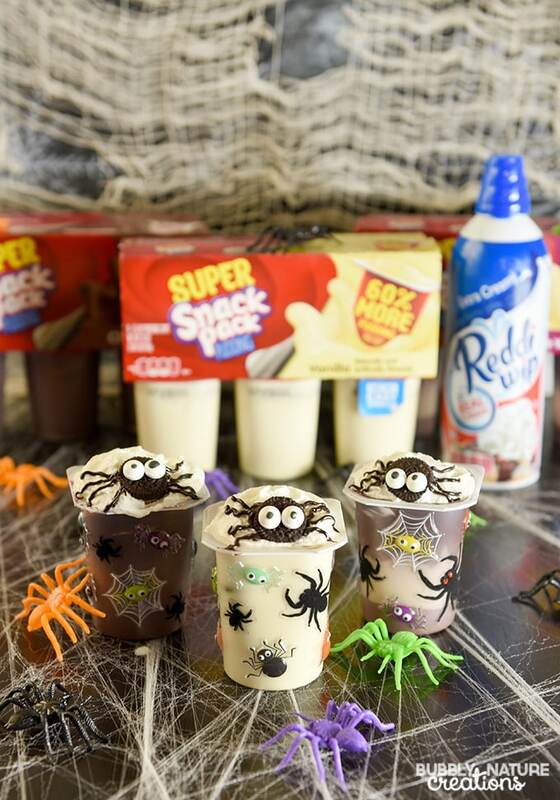 What fun Halloween creations would you make with Snack Pack Pudding Cups?